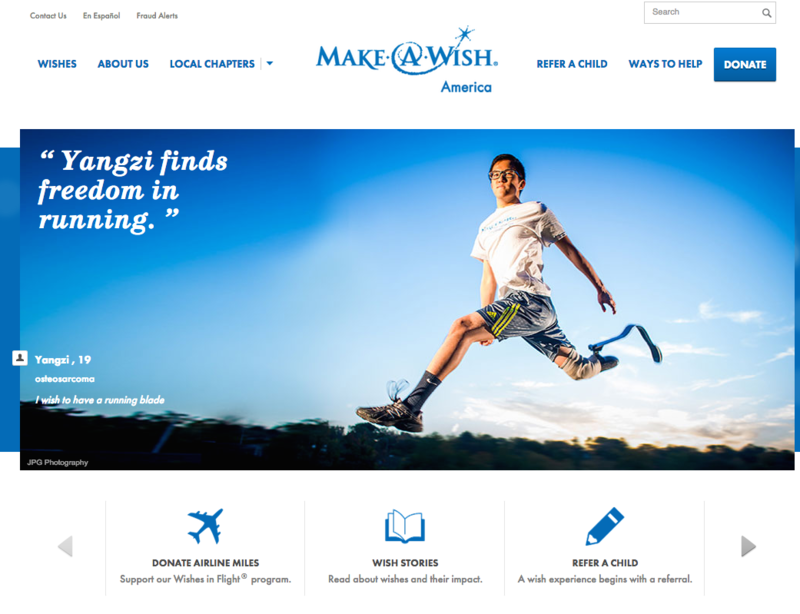 We received an wonderful surprise this week, as the national Make-A-Wish charitable organization has changed it’s dominant home page photo on Wish.Org to a portrait of mine last fall taken of an inspiring young man, Yangzi. He wished for a prosthetic blade after losing part of his right leg to a rare form of cancer, osteosarcoma. Yangzi is athletic — if you couldn’t tell from his jumping abilities below — and he didn’t want to lose these passions for sports and exercise. JPG was asked to document several interviews for the video below, and then had us photograph him sporting the slick, black blade along Kelly Drive, running along the Schuylkill River. Yangzi’s determination and refusal to let his newfound disability conquer his dreams is inspiring and reminded us why our non-profit and charity photography work is so special to us here at JPG. Yangzi, it was an honor to document your journey. And thank you Make-A-Wish for making this dream a reality for Yangzi. We are proud partners.